REPORTS OF A 4-20 “GREEN MOON'” GO VIRAL, BUT ARE THEY TRUE? OR JUST SKUNKY DIRT WEED NONSENSE? The full moon on Wednesday, April 20, will not be green, despite several hoax reports making their way through social media. In fact, the full moon this month will come on Friday, April 22. The hoaxers apparently went with April 20, which might also be referred to as 4-20, to include a street reference for marijuana in their joke. One of the original hoaxers eventually went on to support his original, simple meme of a green-tinted moon with an elaborate, but totally false, explanation involving the alignment of the moon with Uranus. Even that alignment won’t happen. 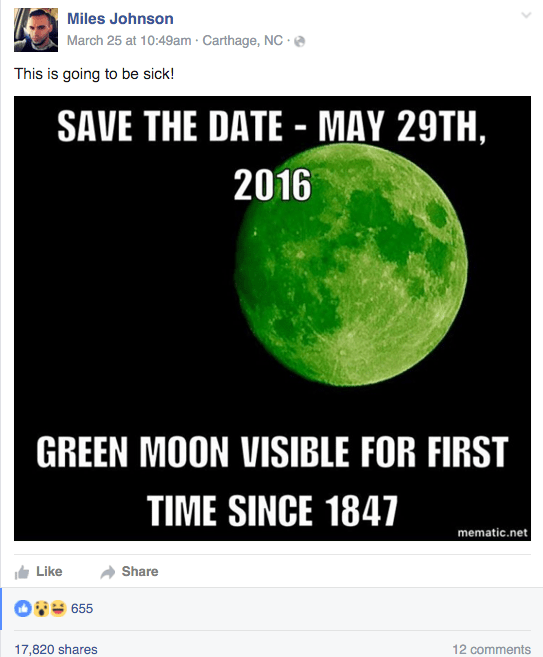 Another version of the hoax moved the green moon to Friday, May 29, but that moon also will not be green nor a full moon. The full moon next month will be on Saturday, May 21, and it will be a blue moon. Not blue in color, but in name. A blue moon traditionally has been the third of four full moons this spring. The phrase “once in a blue moon” originally referred to a rare event. With the modern, online celebrity status of the moon, various, shorter-term versions of blue moon have come into common use. But whatever the name might mean now, it does not mean that the moon will actually be tinted blue. No such naming phenomenon exists for green moon. Some Native American cultures referred to full moon each August as the green corn moon, but was based on the status of their corn crops at that time of year. None of the green moon hoaxes made any reference to green corn moon. Some of the original hoaxes, which apparently were first posted on personal Facebook pages using digitally tinted versions of a NASA photo of a normal full moon similar to the one accompanying this article, have been taken down by their owners, but the rumors continue to spread. Next Next post: DOES A FULL MOON AFFECT YOUR CHILD’S SLEEP? SCIENCE WEIGHS IN WHERE COMMON SENSE DOES NOT.